"No problem." I replied, naively. "The Internet is filled with information for homeschoolers and I hear through the megabytes on forums and lists that the Internet is growing." For extra emphasis, I added, "Rapidly!" 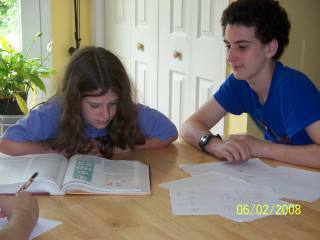 Ten years later, I am still homeschooling and I love it. Yes, the Internet is filled with pages of resources for homeschoolers. I found the websites with worksheets and the state laws. I found the why I should homeschool sites and the educational game sites. Daily use of the Internet has helped me become extremely adept at finding things on just about every school subject possible. What I didn’t find has become my cornerstone for building these pages. This site is dedicated to giving you what you need to homeschool better including things that you may not even know you need to succeed. Sure, I will have some of the traditional resources. I will include a used curriculum for sale section and links to other useful sites. However, what I really want to give you is a reprieve from the usual and give you helpful guidance and support. I'll try to add a bit of humor to keep it lively but the laughter is up to you. What will you find on this site as it grows? I do want to stress that homeschooling isn't just about educating your children. A vital ingredient for a successful homeschool is you. So, please check out the "What about me?" section for ways to renew you. You are doing something wonderful. Finally, I think it is important to be aware of trends in education, homeschooling, and in the world, in general. So I hope to also offer a peaceful place to observe and gauge and discuss these trends. I'm glad you're here. I sincerely hope you find not only what you are looking for but also something more. Sign up to receive a free homeschool newsletter! A monthly newsletter packed with Homeschool Resources, Tips, Quips, Programs, Features and more! As a Homeschool Teacher you are a natural mentor. We need you. We need each other for support, ideas, tips and advice. My Homeschool Place is a great place to share about your homeschool, read about others and learn the truth about homeschooling. Our Daily Homeschool Journal is for you if you wonder about the daily grind of homeschooling? Check out our journal as we log our day to day events. Our Daily Homeschool Journal 2 is for you if you wonder about the daily grind of homeschooling? Check out semester 2 of our journal as we log our day to day events. Healthy U is about realizing your importance in your homeschool and about taking actions to keep you healthy. Why SBI? is about Site Build It and using your interests to earn income online as a career or part time. Did you just spend several hours looking for homeschooling information or resources and you still haven't found what you were looking for? What information do you need to homeschool? What do you want to know about homeschooling? What will help you homeschool better? I want to help fill in those gaps, please consider filling out a homeschool wishlist and let me know how I can help. No matter how long you have been homeschooling, homeschool questions come up. I will try to get you the answers you need quickly. Homeschool news and current events affecting homeschoolers. Homeschool Seeker, a monthly newsletter will deliver new tips, best tips and resources, new curriculum or product finds that may help you and much, much more. USA Geography takes you on an online field trip around the United States of America. Money is tight. Trying to stay on a budget and find good used homeschool books is hard and time-consuming. Then what if those books don't work for you? Where can you re-sell them? Here. Today was a day I said, I need to laugh and so I created Homeschool Fun just in case you are having one of those days, too. Homeschooling articles written for you to help guide your homeschooling journey and to provide you with information to help you homeschool better. From forts to paintings, Kids Create showcases your child's creative projects. The homeschool inquisition began many years ago with the first homeschooler. There is a great educational battleground but the one with true and good motives will be victorious. Puppy Tales is a place to share about your pet, learn from other's pet experiences and practice writing. Would you like to try lapbooking but think it takes too long or takes too much energy...how about making a few mini lapbooks. They are quick and easy. Are you interested in creating lapbooks but need some guidance? Do you feel overwhelmed with the larger lapbooks and information overload they provide. Here I will tell you what you need...just the basics. Ideas for lapbook topics. Lapbooks are great but sometimes it is hard to come up with a topic. Here is a list of topics for you. By subscribing to Homeschool Pride RSS feed you will be informed when any updates are made to the Resources 4 Homeschoolers site. Love conquers Fear around the world with Project Global Warming. Summer homeschool? Do I homeschool year round or take a break? What will we learn about on our summer break, this year? We can make a difference in this world by who we are and what we teach. As a homeschool mom I have learned about the priorities in my life. Faith, Family and Friends. Helping teens explore careers and options available for their future. Everyone has talents/gifts but not everyone uses these gifts to find a career that is just right for them. Would you like to share your knowledge about homeschooling? Great, find out how you can submit your story or tip here.